CAP’N CRUNCH CEREAL COMMERCIAL 1970’s Production multi cel setup of Cap’n Crunch and the kid presented on a color laser background. CAPTAIN CRUNCH CEREAL COMMERCIAL 1960s Commercial production cel of Smedly and the Crunchberry Beast. Presented on a color laser background. 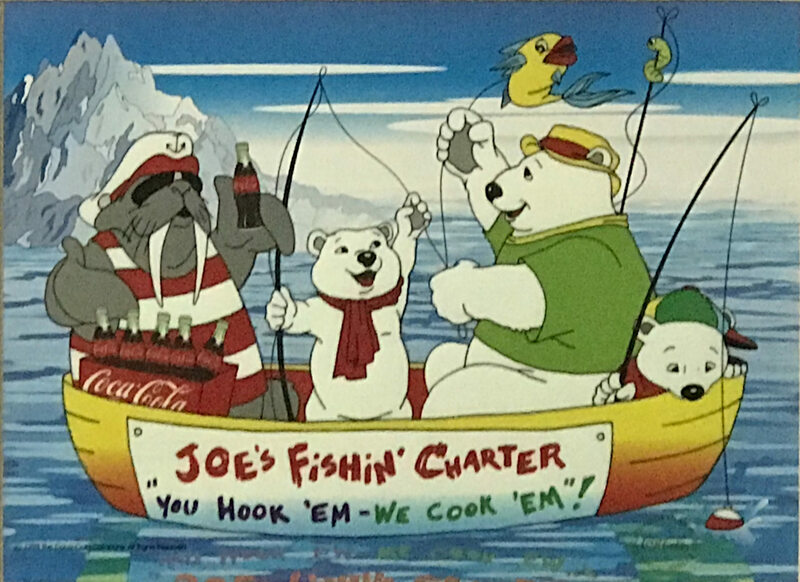 CAPTAIN CRUNCH COMMERCIAL 1980s Production cel of Sea Dog from the Captain Crunch cereal commercials. Frame Damaged. 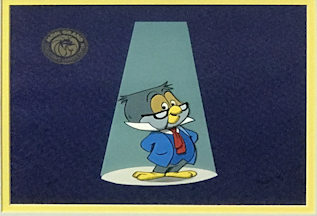 CAPTAIN CRUNCH COMMERCIAL 1964 Very nice hand inked cel of Capt. Crunch and Jean La Foot. Frame damaged and sold as is. TRIX CEREAL COMMERCIAL 1980’s Multi-Cel Production Setup, with Matching Overlays and Key Background, Depicting the Trix Rabbit Trying to Steal His Trix in the Middle of a Political Campaign. This is a Killer Piece. HERSHEY KISSES Digital Computer Reproduction Depicting the Animation of the Hershey Kisses Dancing in their Dressing Room. ZIPLOC BAG COMMERCIAL 1980’s Production Cel of the Very Happy Ziploc Bag Filled with Vegetables. Presented on a Color Laser Background. SUGAR CRISP COMMERCIAL 1980’s Production Cel of Sugar Bear Piloting a Jumbo Jet Filled with Post Super Sugar Crisp Cereal Boxes. Presented on a Color Laser Background. Comes with matching animation drawing. TONY THE TIGER 1951 Black & White Cel of Tony Fighting a Lion. From the First “Frosted Flakes” Commercial. SUGAR SMACKS COMMERCIAL 1980’s Production Cel of “Dig ‘Em”, the Cereal Eating Frog. Presented on a Color Laser Background. RAID COMMERCIAL 1980’s Production cel of the Raid Bug in the Kitchen. Comes with matching animation drawing. Presented on a Color Laser Background. 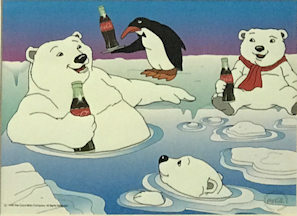 Lumicel of the Coca-Cola Polar Bears in "Catch of the Day." Comes with COA from Coca-Cola. Overall Size 8 1/2 x 11 Inches. Lumicel of the Coca-Cola Polar Bears in "Your Coke, Sir.." Comes with COA from Coca-Cola. RAID COMMERCIAL 1980’s Production cel of the Raid Bug tending the hoards of eggs. Comes with matching animation drawing. Presented on a Color Laser Background. POST SUPER SUGAR CRISP COMMERCIAL 1980’s Production Cel of Sugar Bear and Two Children at the Breakfast Table, Presented on a Watercolor Background. Note: This Cel is Damaged and The Frame Has Scratches. Sold As-Is. POST HONEY NUT CHEERIOS COMMERCIAL 1990’s Production cel of the bee with accompanying cereal box. Triple matted and custom framed. NIKE COMMERCIAL 1993 Totally Fabulous Multi-Cel Production Setup of Charles Barkley and Another Player from the Now Famous Nike Basketball Commercials. Comes with an Additional Certificate Signed by Nike CEO, Philip H. Knight. 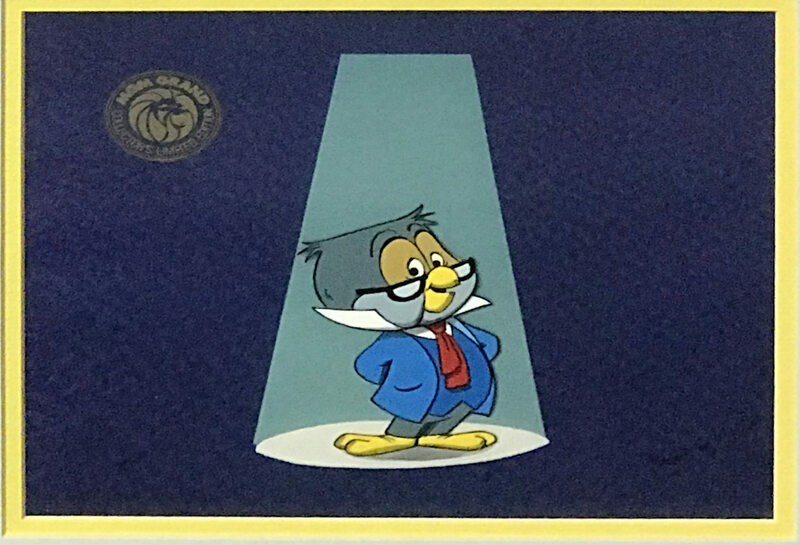 NESTLE’S QUIK COMMERCIAL 1970’s Production Cel of the Nestle’s Quik Rabbit with a Ping Pong Paddle and Ball. Presented on a Color Laser Background. SALE PRICE. CINNAMON TOAST CRUNCH COMMERCIAL 1980’s Production Cel of the 2 Bakers in the Kitchen. Presented on a Laser Copy of the Key Background Layout. LUCKY CHARMS COMMERCIAL 1980’s Production cel of the Leprauchaun from the Lucky Charms cereal commercial. Presented on a color laser background. LUCKY CHARMS COMMERCIAL 1980’s Production cel of the Leprauchaun from the Lucky Charms cereal commercial. Presented on a color laser background. Sold together with matching animation drawing. RICE KRISPIES COMMERCIAL 1972 Storyboard drawing of Snap, Crackle and Pop in a rowboat. From the Woody Woodpecker Show. KRAFT CHEESE COMMERCIAL 1980’s Incredible Multi-Cel Setup and Matching Overlay Cels of the Booths All Presented on its Key Production Background Painting. This Looks Like a Scene out of An American Tail, but it’s from a Kraft Cheese Commercial. Animation by Bluth Bros. Entertainment. Background by Toby Bluth. Hand-Painted Limited Edition Cel Issued for the MGM Grand Celebration Entitled "King Looey's Party." Signed by Berny Wolf. COA Signed by Bill Proctor, Director of Design of Animedia. #1/500. Overall Size 9 1/2 x 8 1/2 Inches. PREAKNESS RACETRACK COMMERCIAL 1975 Production Cel of the Man and the Thoroughbred Horse Sitting on a Bench Reading the Racing Form. EXCEDRIN COMMERCIAL 1977 Original Full Page Layout Design Depicting the Cure for the World’s Biggest Headache. A Bottle of Excedrin. Artwork by Arnie Levin. ESSO GASOLINE COMMERCIAL 1970’s Black & White Production Cel of the Esso Tiger (Tony). Cel Has Red Grease Pen Accents to the Outlines. Presented on a Copy of the Matching Background Layout. PREAKNESS RACETRACK COMMERCIAL 1975 Production Cel of the Man Reading the Racing Form and Going Wild. ELSIE THE COW 1950’S Black & White cel of Elsie the Cow from a Borden’s Ice Cream Commercial. CULLIGAN WATER SOFTENER COMMERCIAL 1985 Production cel of the woman with the annoying voice (“Hey Culligan Man”) from the Culligan water softener commercial. Presented on a color laser background. CULLIGAN WATER SOFTENER COMMERCIAL 1985 Production cel of the woman with the annoying voice (“Hey Culligan Man”) from the Culligan water softener commercial. The sink is a cel as well. Presented on a color laser background. PREAKNESS RACETRACK COMMERCIAL 1975 Production Cel of the Man Reading the Racing Form.